SQL Decrypter Pro is a sql decryption tool that helps DBA and database programmer decrypt the encrypted sql object. It is suitable to use for programmer & DBA. 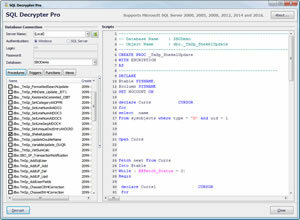 Now feel the convenience of SQL Decrypter Pro!